Marking a major company milestone, Sea Machines is now fulfilling the first orders for its inaugural line of products. 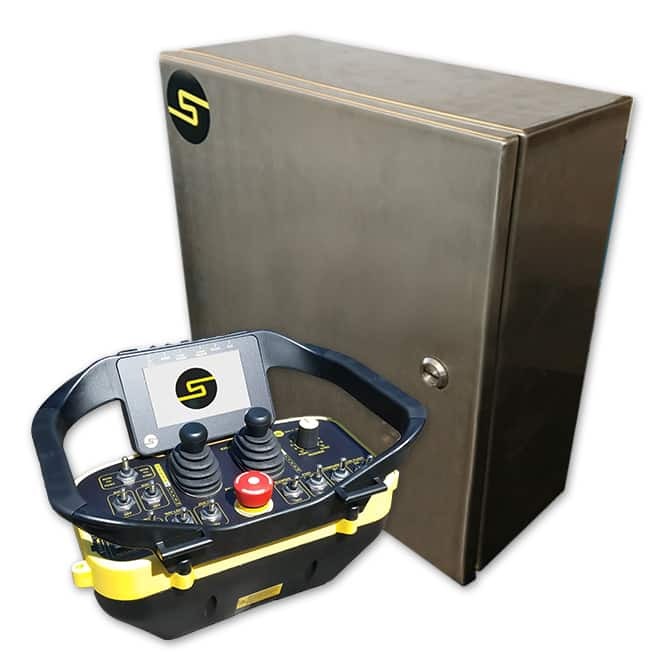 This product line provides customers with two options, the SM300 for operator-in-the loop or “supervised” autonomy and the SM200 for direct, wireless remote control of workboats. Top benefits include the products’ proven ability to increase commercial workboat operators’ productivity, predictability and safety thanks to autonomous command and remote-control functionality. Adding Sea Machines’ technology aboard commercial vessels can reduce workboats’ operational costs by 40 percent or more via increased on-water productivity time, fine course control, reduced crew changes, and in some cases, lowered crew expenses. The Sea Machines SM300 is a top choice because it offers both autonomous control and remote command of workboats via a proprietary joystick and ruggedized, on-board computer, powered by TALOS interface (“the brain”). In short, it is an industry-ready, autonomous control system that enables supervised autonomy of commercial watercraft. TALOS operates with standard Electronic Navigational Charts (ENCs) and allows for the creation of pre-planned or routine, long-duration missions, including survey patterns or search grids. The SM300 features automatically activated, dynamic obstacle avoidance. The system can also broadcast feeds from cameras for remote situational awareness. The included joystick provides remote command from land or a mothership to a workboat or daughter craft within a one-kilometer range. Because a remote-operated workboat in some cases requires no onboard crew, the SM300 can double productivity, thanks to the elimination of time-consuming shift changes and stop-work periods. It also reduces human risk in hazardous situations. One exemplary use case is for hydrographic survey operations, in which an operator deploys the SM300 to perform a line or grid pattern with one set of commands. The technology increases the accuracy of the grid lines with less manpower required to maintain the lines. It’s no surprise then that the company’s first fulfilled orders are in support of the hydrographic survey field, an application that will see tremendous gains from products. The Sea Machines SM200 is a simplified version of the SM300, consisting of the remote-control joystick, but no computer-controlled autonomy. This product serves as industrial-grade system for line-of-sight operations and allows for remote-control functionality of propulsion machinery and deck equipment (such as fire-pumps or winches). It also can also be used as a second control station, allowing an operator to leverage visibility for docking or other tight maneuvers. Like the SM300, the SM200 increases workboat and commercial vessels’ productivity, predictability, efficiency and safety, while providing operators peace of mind. One application is for fireboats, for which Sea Machines has made possible the ability to incorporate a remote-control craft during firefighting, to reduce risk to crews while improving access, vantage points, coverage and deluge. 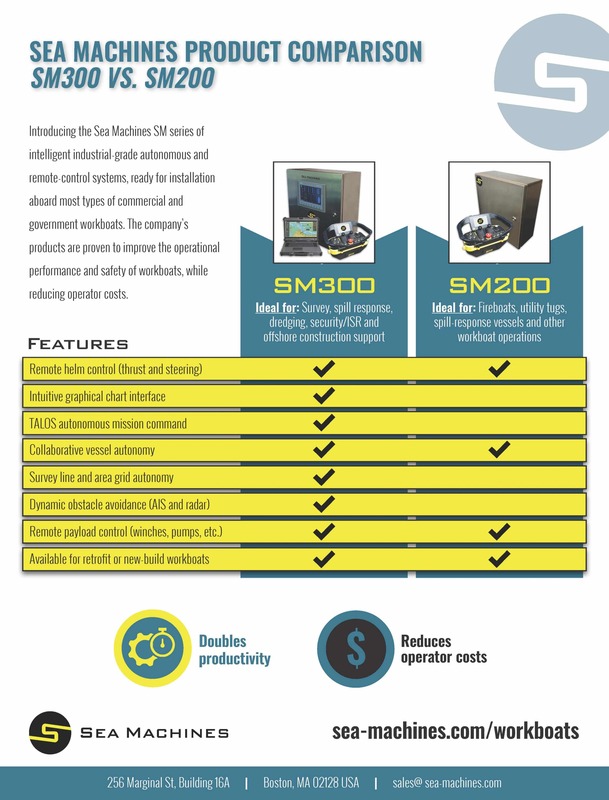 Both the SM300 and SM200 can be added to existing workboats as a retrofit or as part of new-build specifications, typically requiring only 10 components to install. Most vessels can be outfitted with a Sea Machines product in just a couple days. Even for small fleets, the system is surprisingly accessible, thanks to affordable price points or flexible leasing options. If you’re considering adding autonomous command and remote-control functionality to your commercial vessels, Sea Machines wants to hear from you.